On Sale Now! Free Shipping Included! Save 4% on the Large Family Photo Tree Wall Decor Wall Decals Tree Branch Family Like Branches On A Tree Wall Decorations for Living Room by ARES at The Living Wall. MPN: A05. Hurry! Limited time offer. Offer valid only while supplies last. This is a high quality removable decal Vinyl decal is one of the latest trends in home decor, these vinyl decals are removable (but not re-usable). This is a high quality removable decal Vinyl decal is one of the latest trends in home decor, these vinyl decals are removable (but not re-usable). This high quality decal gives the look of being hand-painted without the cost, time, mess, and permanent paint on your wall. You can apply them to walls (smooth or lightly textured), dorm rooms, mirrors, windows, doors, cars, books, lockers or almost any flat surface. 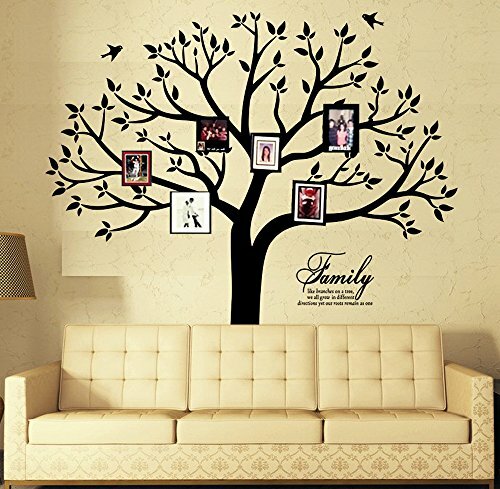 Giant Family Tree Wall Decal,Display your photos on your wall Family Tree Style! Approximate size of the decals: 78.7inch(H)* 78.7inch(W) after application to your wall. Can be adjusted to fit smaller walls if your ceiling is less than 7ft tall. Very easy and creative way to express yourself and fill up space on a wall.